Two days after NASA’s Juno spacecraft streaked over Jupiter’s Great Red Spot, pictures of the solar system’s largest, most powerful storm, have been transmitted to Earth, giving eager scientist close-up views of the 10,000-mile-wide anticyclone where 400-mph winds have been howling for at least 187 years and possibly much longer. The solar-powered Juno reached the low point of its 53-day orbit around Jupiter, at 9:55 p.m. EDT (GMT-4) Monday, passing within about 2,200 miles of the planet’s cloud tops. Eleven-and-a-half minutes later, it made its first pass directly over the Great Red Spot at an altitude of about 5,600 miles and a velocity of some 130,000 mph. The spacecraft’s camera — JunoCam — and its eight other science instruments were all operating at close approach and the first raw, unprocessed pictures were posted on the camera website early Wednesday. Additional processing is expected to bring out much more detail in the images that, when coupled with data from Juno’s other instruments, will shed more light on the nature of the storm and presumably help answer questions that have baffled scientists for nearly two centuries if not longer. Despite long-term observations by ground-based telescopes and a variety of spacecraft, including the Hubble Space Telescope, the Voyager probes and the Galileo orbiter, scientists still do not understand what powers the storm, how deep it extends below Jupiter’s cloud tops, how long it has swirled or even the source of its reddish hue. Likewise, no one knows why the Great Red Spot has shrunk over the past several decades, becoming more circular than oval, whether the reduction is a transient phenomenon or an indicator that the storm may be dissipating. “Not a lot is known,” Scott Bolton, principal investigator with NASA’s Juno probe, told CBS News in an interview Monday. “Here’s the largest and most fierce storm in the entire solar system and it’s lasted hundreds of years, so that’s a lot different than anything else we’ve ever studied. With any luck, the Juno spacecraft might may provide at least some of the answers to Bolton’s questions. While NASA’s Voyager spacecraft captured spectacular zoomed-in images of the Great Red Spot during flybys in 1979, as did the Galileo orbiter in the 1990s and the Cassini probe during its voyage to Saturn, they were not nearly as close to Jupiter as Juno is at the low point of its orbit. 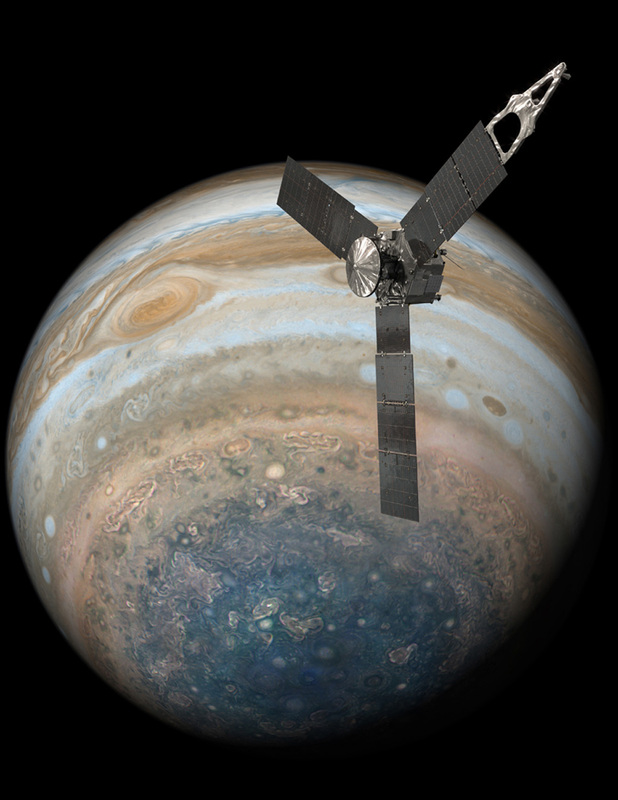 JunoCam is a relatively wide-angle camera intended to provide context for Juno’s other instruments and it was added to the mission primarily to engage the public. Because Juno is spinning, the camera’s images show thin strips of the cloudscape below that can be stitched together later to form a full picture. 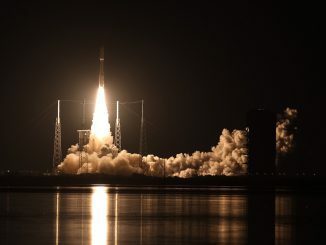 Launched Aug. 5, 2011, the solar-powered Juno picked up a gravitational boost during a close flyby of Earth in October 2013, putting the craft on a trajectory to intersect Jupiter. 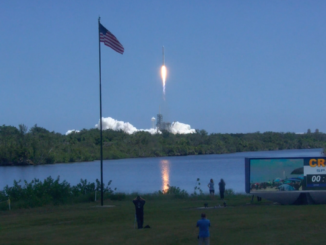 Six years later, on July 4, 2016, Juno’s main engine fired to put the craft into an initial 53-day polar orbit. Mission managers originally planned to maneuver Juno into a 14-day “science orbit,” but they opted not to use the main engine again because of a potential problem with the propellant pressurization system. That will stretch out the time needed to complete the mission’s planned observations, but it has no impact on the quality of the data. The unprocessed JunoCam images of the Great Red Spot will be enhanced to bring out subtle details and other data. Scientists are especially eager to learn how far down into the atmosphere the huge storm might extend. Juno’s microwave radiometer can detect radiation coming from six cloud levels, allowing scientists to get an indirect view of what’s going on as deep as 340 miles below the visible cloud tops. Earlier Juno observations of other regions show “there are motions going on deep in Jupiter … that we did not expect,” Bolton said. 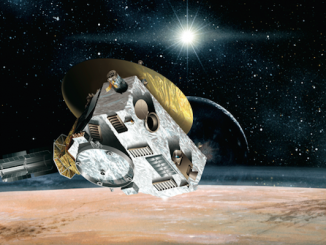 As for how deep the Great Red Spot might extend, “nobody knows,” Bolton said. 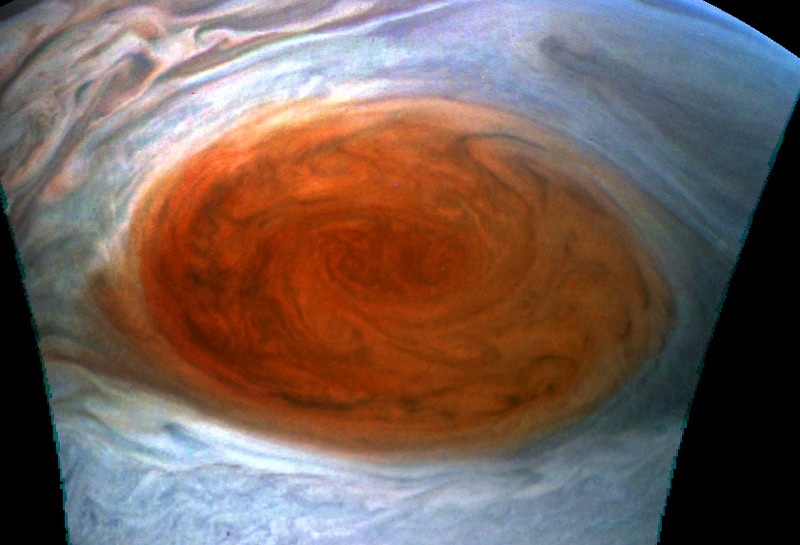 During future passes over the Great Red Spot, Bolton said Juno will map out the gravitational field below and around the storm to find out if there might be a “blob of mass” far below the cloud tops that could play a role in the storm’s persistence. “We will not look at that on this flyby but some future one,” Bolton said. “The first (pass) is just look remotely, we’ll see down a few hundred kilometers. … We’ll sort of just investigate how does the veneer of Jupiter match with what’s underneath.